In times of division, finding our commonalities and what makes us unified is what is most nourishing to our collective soul; being brothers and sisters to one another, in spite of our differences, brings wholeness and health to our being. And there’s nothing like a good meal to enliven and bring souls together. 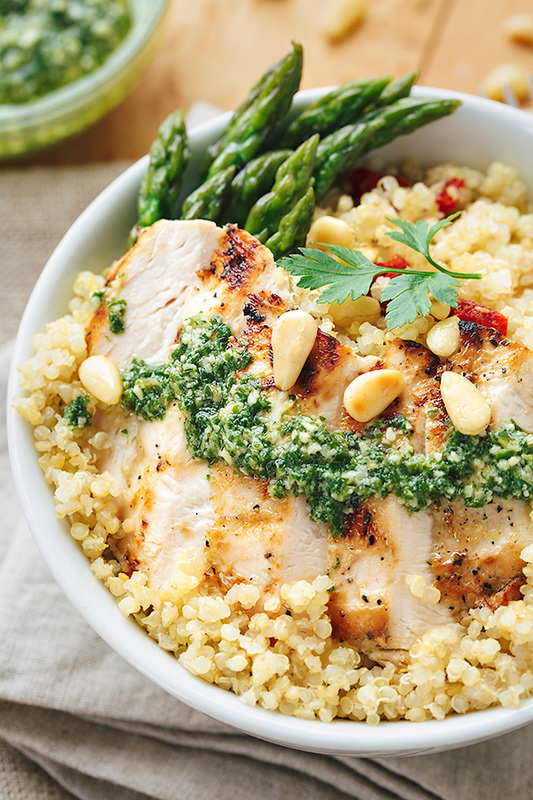 We hope to inspire unity and wellness with this lemon chicken pesto bowls recipe—may it be prepared and shared with love. There is a gentle yet undeniable prompting that this new year has whispered into my very soul, and I feel compelled to listen and to respond with humility yet unrelenting ferocity. It is imploring me to truly begin afresh and anew, and to search my heart and my soul, those inner most sacred places, for the truest and most authentic version of myself, my best self. This new year urges me to find out who I really am, what I am truly made of; it implores me to long for more but more in the way of expecting the most that is possible from my self—expecting more love, compassion, truth, and more desire for unification with others to flow out of me and into the world that surrounds me. I feel compelled to not settle, to no longer cope (a true four-letter word), but to put all of the fire and wind within me to work towards being an ingredient, however small, in the soothing salve that needs to gently and carefully be applied to our collective wounds and raw areas in order for some healing to take place. I long to be a bridge builder, one that participates in actively seeking out those qualities that connect us to one another rather than separate us, as I am so very tired of our separation. I long to search for those attributes that we share in common, those things that make each of us uniquely human and uniquely matter to one another, and that help us to form a bond, one that we all can rely on as we go forward into the future with all of our collective hopes and dreams to simply be loved. The still quiet voice within me longs to shed all of those things that hold me back from being a bridge builder, that keep me from loving my fellow brothers and sisters in the fullest way possible; I yearn to discard anything that keeps me feeling separated from my fellow human beings, and that keeps even a flicker of anger or resentment alive within me—it needs to be put down, to not be fed. For me it’s time to turn off anything that potentially breeds disconnect or stirs up frustration, and to cling rather to kindness, uplifting words, and anything else that will encourage and inspire us to work side by side, shoulder to shoulder, mingling our blood, sweat and tears, in spite of any differences we may have. I want to learn what it is to answer anger with love because that is where true peace and freedom lies, where transcendence takes place, and where the heart begins to open and allow the light in; after all, that is the point at which it becomes one of supple, soft and yielding flesh rather than one of stone. Love, empathy, understanding, being slow to anger, and the willingness to be open to another are the ties that bind. They are the little, individual planks in these bridges that needs to be built between us. They are the ingredients that nourish and bring strength, health, and the most meaningful pleasure to our existence. Without them, we slowly disappear. 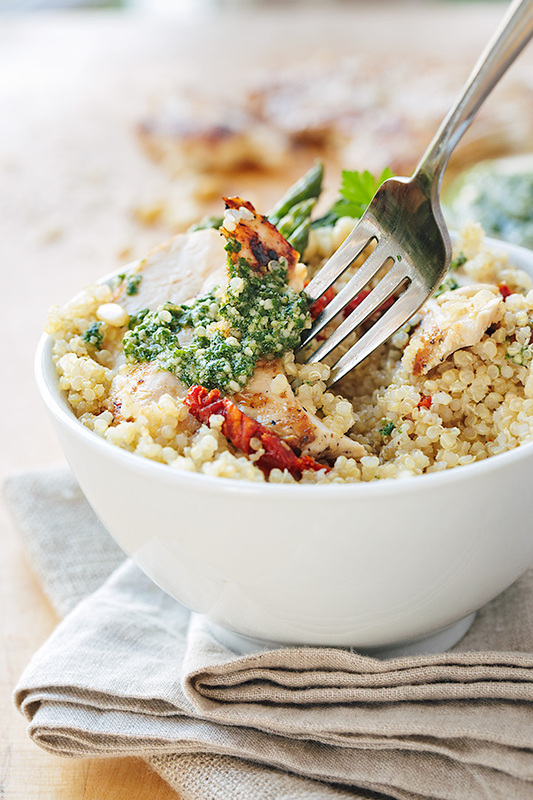 So in the spirit of health, strength and nourishment, in the spirit of connecting and coming together, I offer you a recipe to enjoy and share, and perhaps even bond with another over: lemon chicken pesto bowls with sun-dried tomato quinoa. -Place the chicken cutlets into a bowl, and drizzle over about 2 tablespoons of the oil, plus a couple of good pinches of salt and pepper; add in the garlic, plus the lemon zest and juice, and toss to coat; allow to marinate for at least 20 minutes (or even overnight if doing ahead). 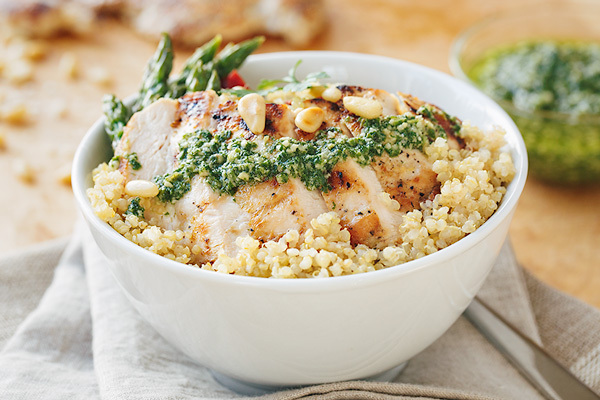 -While chicken marinates, prepare your quinoa by rinsing it first in cold water; add it to a pot along with the chicken stock, bring to the boil, then reduce heat, cover, and simmer for about 20 minutes or until the water is absorbed; allow to sit for a few minutes before fluffing with fork, and spooning into a bowl. 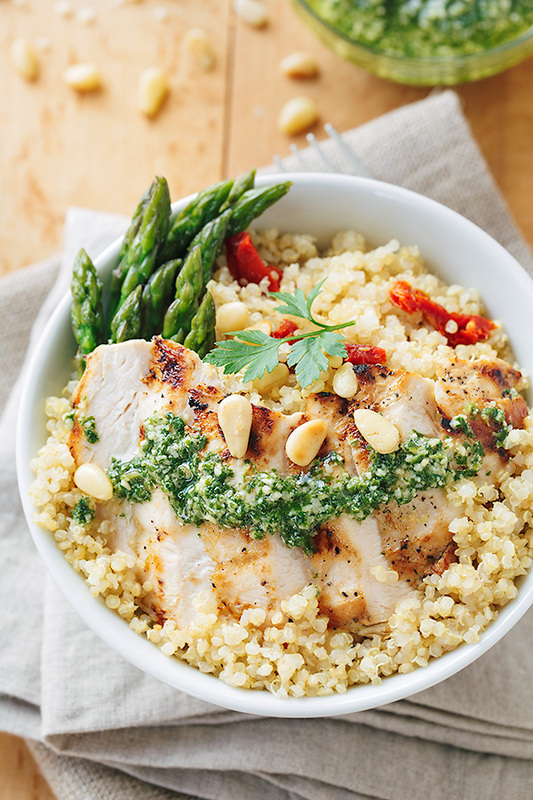 -Add the julienned sun-dried tomatoes to the quinoa, and toss together; set aside, keeping it warm. -To grill your chicken, place your grill pan over medium-hight heat, and drizzle in a touch of the oil; once hot, add in the chicken and grill until golden-brown, about 4 minutes per side; remove and allow to rest for a couple of minutes before slicing the cutlets on the bias. 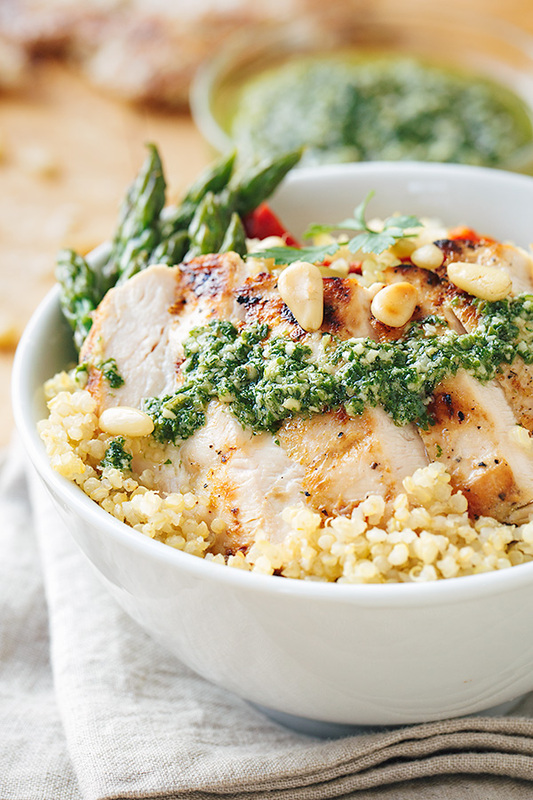 -Add the lemon juice, zest, garlic, pine nuts, the parmesan cheese, plus 2 tablespoons of the oil to the bowl of your food processor, and process until blended; add in a pinch or two of salt, and the basil leaves, and process together while drizzling in the rest of the oil, until smooth and well-blended; check to see if additional salt is needed. 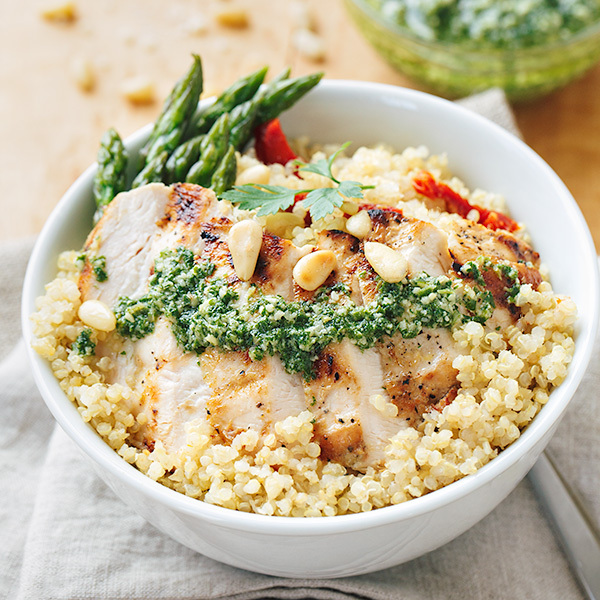 -Spoon into a covered container, and cover the pesto with a thin layer of oil; cover and keep in fridge until ready to use (or for up to a week), but fresh is best for this recipe. Velva, thank you so much…very kind, and may you have an amazingly rich & blessed year! Just finished making/eating this!!! Oh my word, it’s a new favorite. I adored it. Even my kids loved it!! Thanks for the great recipe.??? ?